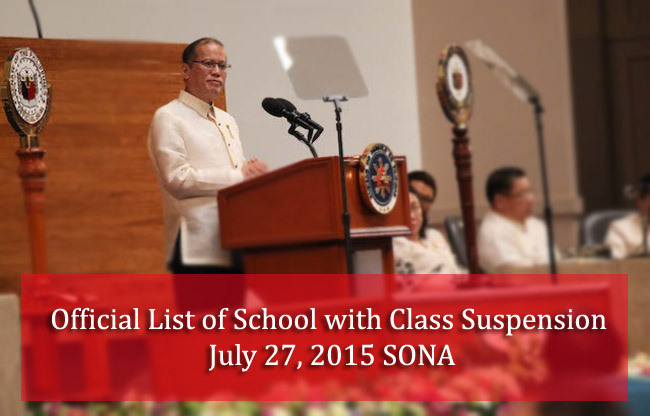 In accordance with the upcoming last State if the Nation Address by President Benigno PNOY Aquino III this coming Monday, July 27, 2015, Department of Education (DepEd) had officially announced the list of schools with class suspension. Around 32 elementary and secondary public schools in Quezon City had been announced to have their classes suspended. This is due to avoid worst traffic scenario in the area around the House of Representatives (Batasan Pambansa). Far Easter University Diliman and Miriam College also announced class and work suspension in all their levels, while Ateneo De Manila University announced that only afternoon grade school classes will be suspended. SONA is constitutional obligation delivered by the Philippine president every year as mandated by Article VII, Section 23 of the Philippine 1987 Constitution. The speech may include the Chief Executice reports of the current state of the country, and the government’s agenda for the coming year.